The society and the county museum were both born during Indiana’s statewide centennial celebration of 1916. A local Chamber of Commerce exposition to celebrate the occasion included a large historical exhibit, which became one of the leading attractions at the event. At about the same time, the Kokomo Woman’s Department Club, along other civic-minded residents, started the historical society and dedicated the organization to the preservation and dissemination of local history. The county museum opened in the Carnegie Library in 1923 using many of the artifacts displayed during the 1916 exposition. The collections rapidly outgrew the library, though, with artifacts reportedly stored in several scattered locations. The construction of a new courthouse in 1937 provided an opportunity to pull all of the collections together in one location, where they could be available for public display. A Works Progress Administration project moved the museum there in 1939. In 1957, the historic Vermont covered bridge was about to be destroyed by construction of the Wildcat Reservoir. The historical society lobbied to save the bridge, raised money, and eventually obtained permission to disassemble the bridge and rebuild it in Highland Park. In 1964, Indiana University was preparing to vacate its classrooms in the Seiberling Mansion, which it had owned since 1946, and move to a new campus. The community began to consider what to do with the mansion and the idea of a new home for the county museum was proposed. Almost immediately, the historical society began working toward that goal. 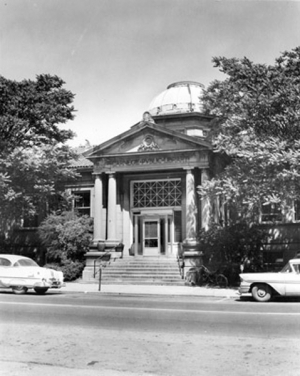 In 1971, Howard County took possession of the building in partnership with the society. HCHS was honored with the 2008 Outstanding Local History Organization award from the Indiana Historical Society and was recognized again in 2012 with the IHS Outstanding History Project award for the Ryan White Oral Histories.